First, the good news: Leading employers know they need to create healthy cultures to attract and retain top talent, improve productivity, contain medical costs, and boost employee engagement. Increasingly, corporate America is implementing innovative workplace wellness programs to make it easier and more fun for their employees to adopt and sustain healthy lifestyles. A full 86 percent of U.S. employers offer some form of wellness program, according to the Society for Human Resource Management (SHRM). The bad news: Most companies still struggle to keep their employees engaged in long-term healthy behaviors and fail to get the biggest bang out of their wellness program buck. Participation rates have remained frustratingly low — under 15 percent, on average. Healthcare costs, meanwhile, continue to rise. Although the escalation in the amount employees pay for their share of medical benefits has slowed, the increase for 2013 is still expected to outpace wage growth, according to the Kaiser Family Foundation and the Health Research & Educational Trust. So many variables can affect your employees’ decision to enroll and stay engaged in your wellness programs. Working with your program providers, you can build many of those factors into the design of your programs. Other factors, however, stem directly from your organization’s culture. These factors — ones driven by your organization rather than by your program providers — are the focus of this white paper. This paper draws on a wealth of experience, external research, and Virgin HealthMiles’ robust analysis of client data to outline the key factors within your organization that can drive your employees to enroll in, and stay engaged with, your workplace wellness programs. 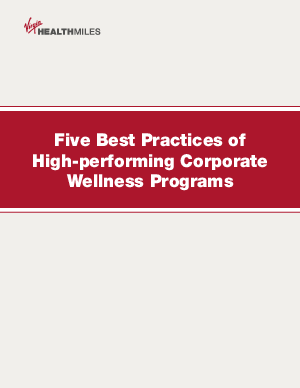 Our research shows high-performing wellness programs share five key factors that are missing among companies with lower-performing programs.